What better way to feast like a King on a budget than foraging? Spring’s bounty is plentiful, if you know where to look and what to look for. My favourite ‘weed’ is wild garlic. 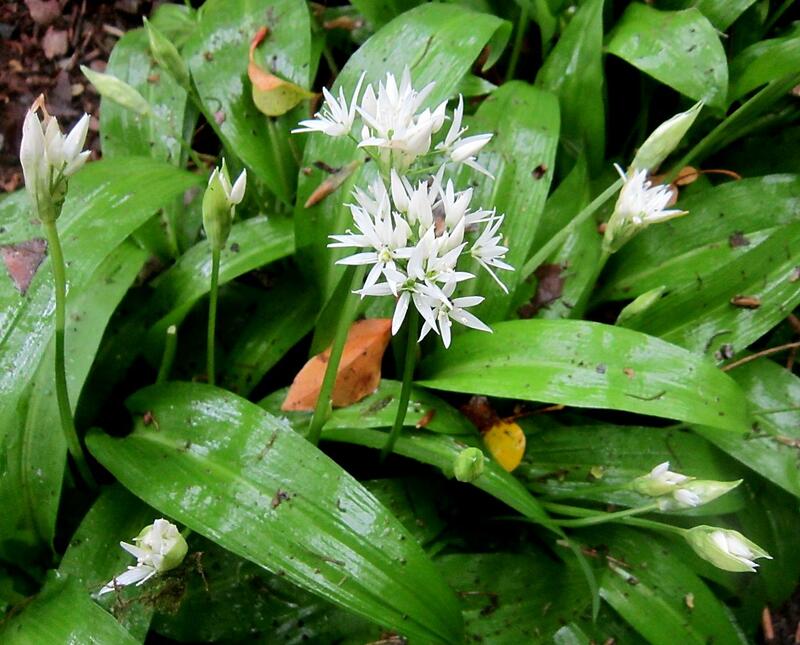 To dispel any confusion with the name, I’m talking about Allium ursinum, which can also be called ramsoms or rather fittingly bear garlic – as brown bears go crazy for the bulbs and, well, ursus is the Latin for bear. You can find them in moist, shady spots in deciduous woodland, especially on acidic soils, so we’re lucky enough to have plentiful swathes spring up all around us, filling the air with a distinctive garlicky scent – you can often smell them before you see them! You have to be careful that you don’t mistake the individually stalked leaves with the superficially similar but poisonous leaves of Lily of the Valley, which if you look closely sprout from an individual purple sheathed stem (though to confuse this further, I think those across the pond in the U.S. and Canada forage ‘Ramps’ or Allium tricoccum which does have a purple tint on it’s lower stem). If in doubt, crush a leaf between your forefingers and thumb – it should smell strongly of garlic. Or you could wait for the starry white flowers to appear in late April/early May if you want to be positive, as it is always better to be safe than sorry. To follow the rules of happy foraging, remember that it is illegal to uproot a plant under the Wildlife and Countryside Act, unless it is on your own land or you have the landowner’s permission. That said, leaves, flowers, fruits and nuts are fair game, unless the species is protected like the now scarce cowslips. It is good practise to take a leaf or two from several plants, rather than stripping one completely bare. I apologise for stating the obvious (I am an ecologist), so please please please only take what you need – never more than a third of the population – and you’ll have plenty to collect the following year. 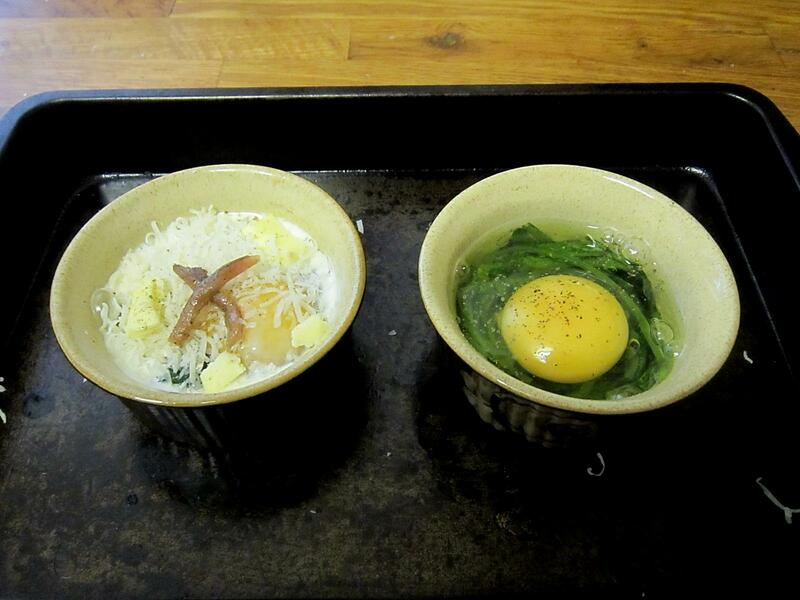 Wild garlic can be used in cooking where you’d use a clove or two of the headier cultivated variety. It’s not quite garlic, not quite onion, and not quite leek. The pungent leaves impart a wonderful oniony-garlicky flavour to all manner of dishes, like risotto, pesto, and frittata, so what better start to a lazy Sunday brunch than dipping crunchy croutons into creamy wild garlic baked eggs? METHOD: Wash thoroughly, and blanch the wild garlic leaves in boiling water for a couple of seconds, plunging them into cold water immediately afterwards to stop further wilting. 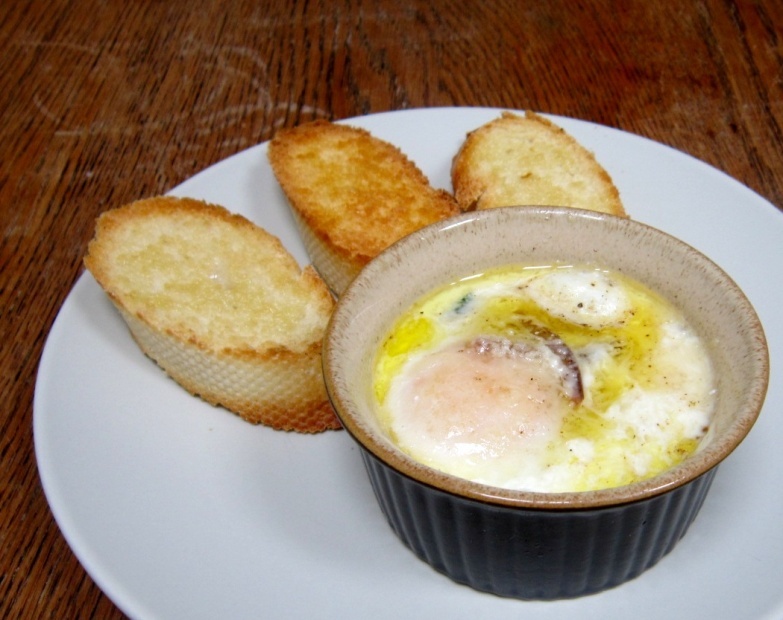 Lay half the leaves in the bottom of a ramekin then grate or add a pinch of nutmeg and season lightly. 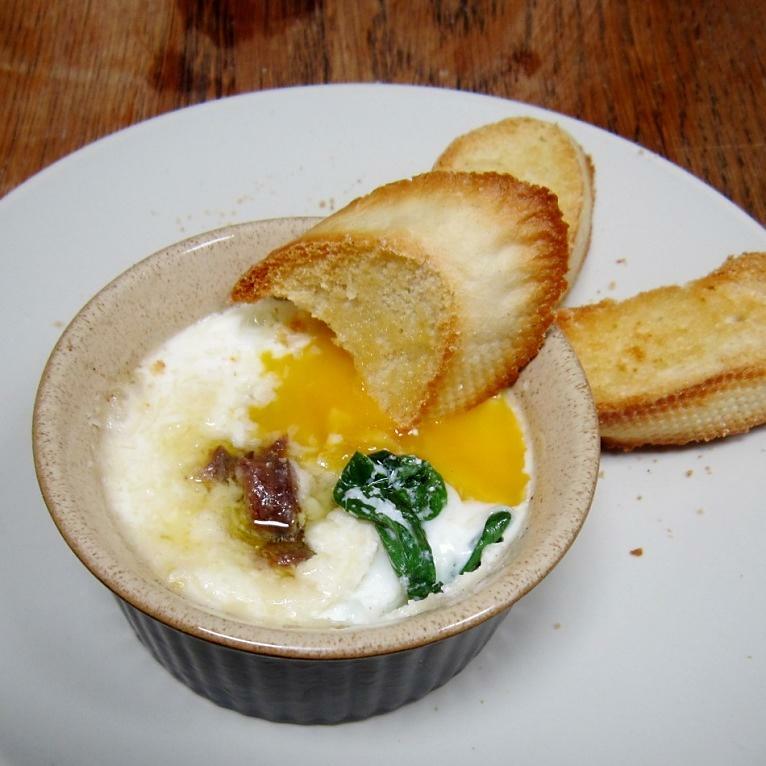 Carefully break an egg on top and spoon over two teaspoons of cream, half an anchovy fillet (if using) and grate over some parmesan. Season (easy on the salt if using the anchovy) and add a couple of flakes of butter.Place the ramekin in a ‘bain-marie’ a.k.a. a roasting tin half-filled with hot water and bake in the oven at 190˚C for 10-12 minutes, or until the white has just set. Serve with garlic croutons (slices of toasted crusty bread rubbed with a garlic clove and drizzled with olive oil) and a strong coffee and enjoy!